I've been tracking players on the GW2 achievement leaderboards. I was able to track players on 23 EU servers for one month [February 20th to March 23rd]. In that month, I observed 1456 players that likely transferred servers. That makes a 0.2% chance that a top 1000 player server transfers on any given day - or - a 6.6% chance that a top 1000 player changes servers over the course of a month. Caveat: some of my data collection was corrupted - from both my ISP (TimeWarner <glare>) and the ArenaNet website (the website got angst-y partway through my data collection). So I'm missing some servers. Take the resulting numbers with salt. 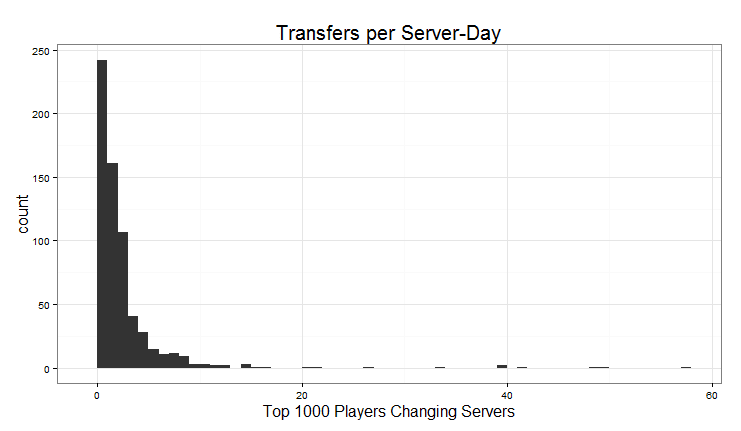 Transfers are highly clustered: on most days on most servers, at most one player out of the top 1000 transfers (65% of all server-days look like this). However, on some servers, on some days, large clusters of players leave the server (record observed: 57 of the top 1000 players left Underworld on March 20th). Transfers also differ by day: on March 7th, ArenaNet announced a reduction in the cost of server transfers starting on March 18th. This resulted in a considerable rise in the number of transfers. Before March 18th, an average of 1.9 top 1000 players transferred per server each day. After March 19, that number jumped to 4.7. But while these transfers were designed to encourage players to move to lower-tiered servers, they had something of a bandwagon effect. After the update, very few top 1000 players left gold-tier servers. Most of the movement came from the Silver / Bronze tiers. I'm actually surprised at just how common server transfers are. Post-March 18, nearly 10 of the top 1000 players in Silver tier on every server changed servers each day. That is a remarkable change in the population of each server. I'm also not surprised that most transfers originate on Silver / Bronze servers. WvW match-ups on these servers can be frustrating, and it makes sense that players would seek a stronger world environment.